As one of our most popular Udacity courses, the Developing Android Apps course was recently updated to ensure developers have the resources to build high quality apps. This course, which has already helped more than half a million developers learn to build Android apps, has been through the car wash and come out sparkling clean and updated. Google and Udacity have worked together to update the course to include the very latest changes in Android and Android Studio, including how to use the new Constraint Layout editor, and how to use Firebase Job Dispatcher. Learn best practices for building Android apps using Android 7.0 (Nougat) while keeping your apps backwards compatible in older versions, learning at your own pace in your own time. You sent us feedback that some of the lessons were a little difficult to get through, so we've restructured the lessons and added smaller apps for you to build as you progress through the course. So not only will you build the Sunshine weather app as a complete, integrated application that spans the entire course, but you'll also create an app in each lesson to help you learn individual concepts. Build a To Do app and add new tasks as you learn how to build a ContentProvider. This course brings back Android experts Dan Galpin and Reto Meier from Google, and Lyla Fujiwara from Udacity, and introduces new faces from Google and Udacity. Start learning now at https://www.udacity.com/course/ud851. This updated course teaches the skills that are tested by the Associate Android Developer certification exam. Udacity is offering a package that combines the updated Developing Android Apps course with a voucher for the Associate Android Developer certification exam. If you pass this exam, you will earn the Associate Android Developer Certification and show that you are competent and skilled in tasks that an entry-level Android developer typically performs. Enroll in Udacity's Fast Track to get prepared and take the Associate Android developer exam at: https://www.udacity.com/course/nd818. The G Suite team recently launched the very first Google Slides API, opening up a whole new set of possibilities, including leveraging data already sitting in a spreadsheet or database, and programmatically generating slide decks or slide content based on that data. Why is this a big deal? One of the key advantages of slide decks is that they can take database or spreadsheet data and make it more presentable for human consumption. This is useful when the need arises to communicate the information reflected by that data to management or potential customers. Walking developers through a short application demonstrating both the Sheets and Slides APIs to make this happen is the topic of today's DevByte video. The sample app starts by reading all the necessary data from the spreadsheet using the Sheets API. The Slides API takes over from there, creating new slides for the data, then populating those slides with the Sheets data. Creating tables is fairly straightforward. Creating charts has some magical features, one of those being the linkingMode. A value of "LINKED" means that if the Sheet data changes (altering the chart in the Sheet), the same chart in a slide presentation can be refreshed to match the latest image, either by the API or in the Slides user interface! You can also request a plain old static image that doesn't change with the data by selecting a value of "NOT_LINKED_IMAGE" for linkingMode. More on this can be found in the documentation on creating charts, and check out the video where you'll see both those API requests in action. For a detailed look at the complete code sample featured in the video, check out the deep dive post. We look forward to seeing the interesting integrations you build with the power of both APIs! Today we are launching preliminary Windows support for TensorFlow. Native support for TensorFlow on Windows was one of the first requests we received after open-sourcing TensorFlow. 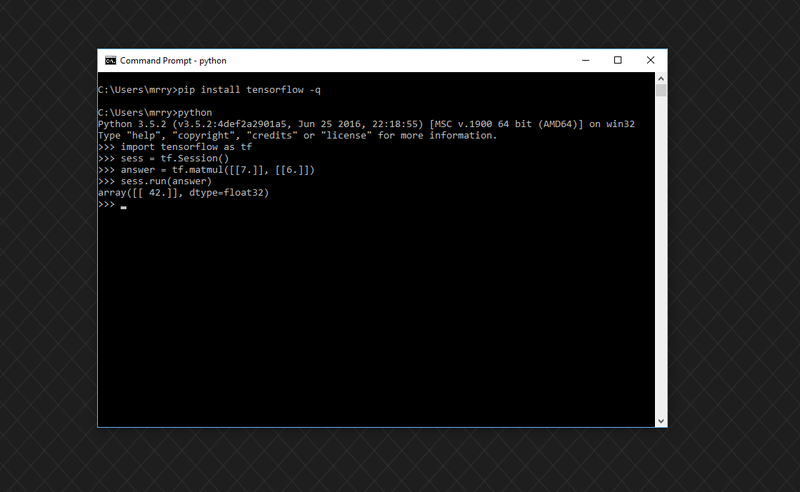 Although some Windows users have managed to run TensorFlow in a Docker container, we wanted to provide a more complete experience including GPU support. With the release of TensorFlow r0.12, we now provide a native TensorFlow package for Windows 7, 10, and Server 2016. This release enables you to speed up your TensorFlow training with any GPU that runs CUDA 8. More details about Windows support and all of the other new features in r0.12 are included in the release notes. We're excited to offer more people the opportunity to use TF at maximum speed. Follow us on Twitter to be the first to hear about future releases – we're @tensorflow. Many people have contributed to making this release possible. In particular, we'd like to thank Guenther Schmuelling and Vit Stepanovs from Microsoft for their significant contributions to Windows support. 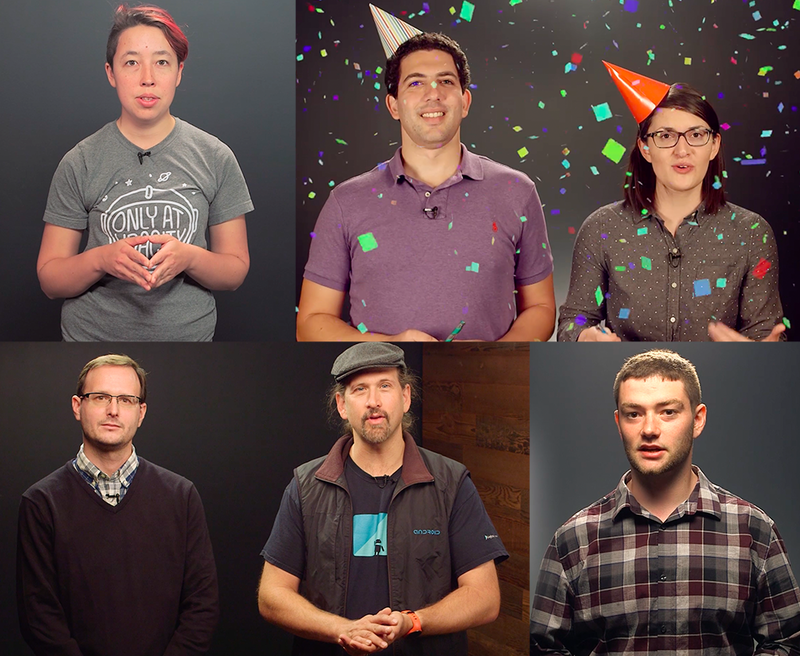 It’s that time again: Google Code-in starts today! Today marks the start of the 7th year of Google Code-in (GCI), our pre-university contest introducing students to open source development. GCI takes place entirely online and is open to students between the ages of 13 and 17 around the globe. Tasks take an average of 3-5 hours to complete and include the guidance of a mentor to help along the way. Complete one task? Get a digital certificate. Three tasks? Get a sweet Google t-shirt. Finalists get a hoodie. Grand Prize winners get a trip to Google headquarters in California. Over the last 6 years, 3213 students from 99 countries have successfully completed tasks in GCI. Intrigued? Learn more about GCI by checking out our rules and FAQs. And please visit our contest site and read the Getting Started Guide. Teachers, if you are interested in getting your students involved in Google Code-in you can find resources here to help you get started. Welcoming the third class of Launchpad Accelerator with expansion into new countries! After two successful classes, we're excited to announce the next group of promising startups for the third class of Launchpad Accelerator. The startups from Brazil, India, Indonesia, and Mexico will be joined by developers from five additional countries: Argentina, Colombia, Philippines, Thailand and Vietnam. The program includes intensive mentoring from Google engineers, product managers and other expert mentors from top technology companies and VCs in Silicon Valley. Participants receive equity-free support, credits for Google products, PR support and work closely with Google for six months in their home country. Class 3 kicks off early next year (January 30) at Launchpad Space, our physical space in San Francisco where developers and startups can get free technical training, one-on-one mentoring and more education geared towards helping them successfully build their apps & startups. If you're interested in applying for future Launchpad Accelerator cohorts, we encourage you to follow us on the Launchpad Accelerator site to receive updates. We also expect to add more countries to the program in the future. Stay tuned! To build awareness of the awesome innovation and art that indie game developers are bringing to users on Google Play, we have invested heavily over the past year in programs like Indie Corner, as well as events like the Google Play Indie Games Festivals in North America and Korea. 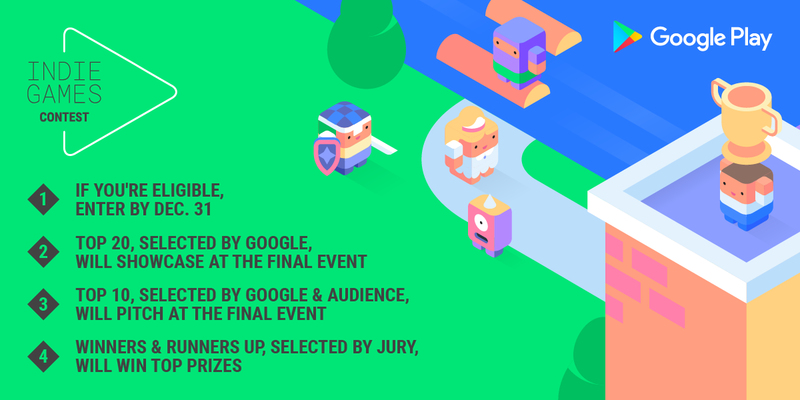 As part of that sustained effort, we also want to celebrate the passion and innovation of indie game developers with the introduction of the first-ever Google Play Indie Games Contest in Europe. The contest will recognize the best indie talent in several countries and offer prizes that will help you get your game noticed by industry experts and gamers worldwide. If you're based in Czech Republic, Denmark, Finland, France (coming soon), Germany, Iceland, Israel, Netherlands, Norway, Poland (coming soon), Romania, Spain, Sweden, Turkey, or UK (excl. Northern Ireland), have 15 or less full time employees, and published a new game on Google Play after 1 January 2016, you may now be eligible to enter the contest. If you're planning on publishing a new game soon, you can also enter by submitting a private beta. Check out all the details in the terms and conditions. Submissions close on 31 December 2016. Up to 20 finalists will get to showcase their games at an open event at the Saatchi Gallery in London on the 16th February 2017. At the event, the top 10 will be selected by the event attendees and the Google Play team. The top 10 will then get the opportunity to pitch to a jury of industry experts, from which the final winner and runners up will be selected. Even if you're not eligible to enter the contest, you can still register to attend the final showcase event in London on 16 February 2017, check out some great indie games, and have fun with various industry experts and indie developers. We will also be hosting a workshop for all indie games developers from across EMEA in the new Google office in Kings Cross the next day, so this will be a packed week. Enter the Indie Games Contest now and visit the contest site to find out more about the contest, the event, and the workshop. In September, we launched a new way to search for content in apps on Android phones. With this update, users were able to find personal content like messages, notes, music and more across apps like OpenTable, Ticketmaster, Evernote, Glide, Asana, Gmail, and Google Keep from a single search box. 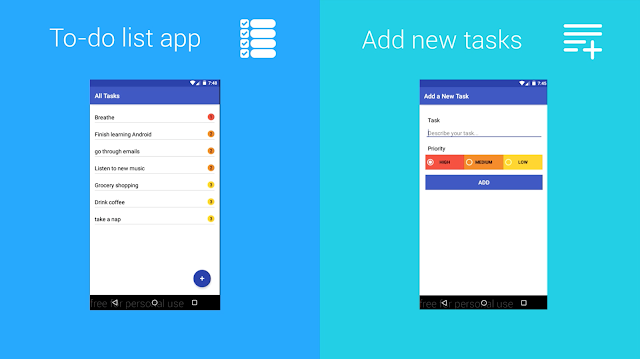 Today, we're inviting all Android developers to enable this functionality for their apps. There are several predefined data types that make it easy to represent common things such as messages, notes, and songs, or you can add custom types to represent additional items. Plus, logging user actions like a user listening to a specific song provides an important signal to help rank user content across the Google app. Example of adding or updating a user's shopping list in the on-device index. Integrating with Firebase App Indexing helps increase user engagement with your app, as users can get back to their personal content in an instant with Google Search. Because that data is indexed directly on the device, this even works when offline. To get started, check out our implementation guide and codelab.